Rambling around my Life: Starting the Gypsy Quilt - Caravan Wheels and Hoop Earrings ? Starting the Gypsy Quilt - Caravan Wheels and Hoop Earrings ? I have been dithering over what design to use for the 12 fat quarters of Gypsy by Westminster which I won in a give-away on Want It, Need It, Quilt! Every day I chose a different design. But it wasn't until I remembered the KISS principle of keeping it simple that I realized that I didn't need a complicated pattern with all these bright colours jumbled together in every block that I finally made a decision. So, I'm finally happy. I like these and I can even imagine that I can see caravan wheels and gypsy hoop earrings in the blocks. And by only using one fabric in each block, each of the different fabrics gets an opportunity to make it's own statement. My only problem today was with the bottom right hand red block. It should have been much more dramatic as I had fussy-cut the circles in the pattern - two with white dots and two with a white cross-hatching. But in my usual fashion I cut the squares 1/2" too small so now I will have four interesting red hexie flower centres! 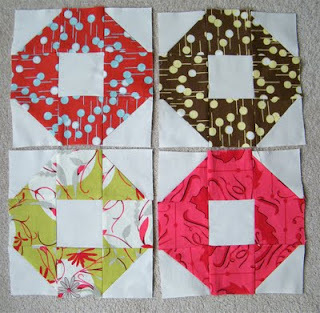 Now my mind is jumping ahead to when I have made the first block from each fat quarter and am starting on a second one. Should I continue to use the cream centres or should I make them from one of the contrasting fabrics, eg red at the centre of the lime green block and green in the red block. These more solid blocks could then be used in alternate positions in the quilt. Or should I stick to cream centres. Then there's how shall I quilt it. No wonder I can't sleep. My mind is always jumping ahead. I really like the cream centers.. the center square contrasting would make a nice quilt too but totally different feel that with cream. Looking for ward to seeing it done!